How do you tell your daughter that her horse has died? My daughter had wanted to ride horses for a couple of years (and Ellen secretly – or not so secretly – wanted to ride with her). We finally relented and KJ started riding lessons. 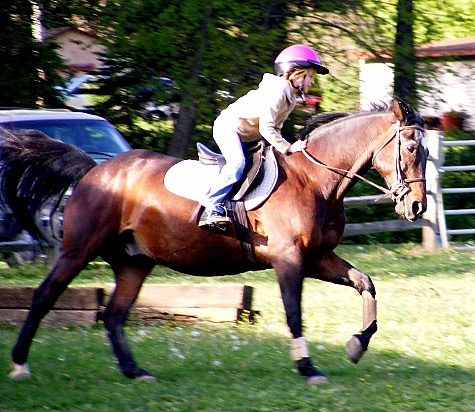 At the beginning of the summer we decided to use the money from the lessons instead to half-lease a horse, so KJ could ride whenever she wanted to. This worked out great, and we leased Brandy. KJ was so excited, and really bonded with that horse. 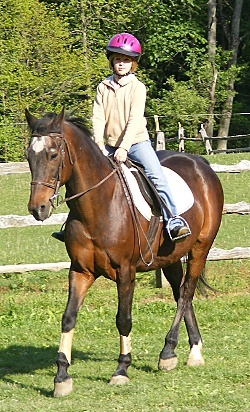 She would take her out several times a week, and even showed her at a local horse show. She was getting Brandy ready to show at the county fair next week. Over the weekend we got a message from the stable – Brandy was colicky and it was probably best that KJ not come out to ride. One of the girls at the stable had taken Brandy out for a trail ride and apparently it was too much. Yesterday was the first day of school, and KJ’s first day in middle school. She was a bundle of nerves and energy. About mid-day we got the word – Brandy didn’t survive. In the afternoon we got to see the joy, the excitement, the laughter that came from KJ’s great day at a new school, but we knew that we were about to smash her world in two. Ellen told her about Brandy, and she ran crying to her room. I was devastated. I felt so helpless. I just wanted to wrap her up in my arms and keep the world out. But, of course, I couldn’t. And shouldn’t. An aside: the worst part of this for me is the feeling that I let KJ down. I never got to see her ride Brandy. I always had something else to do when she was out at the stable to ride. I legitimately couldn’t make the horse show – I was doing something with our son. I was really looking forward to the county fair. I was so proud of what she was doing, and I know now how fragile this existence can be. I pledge to be better in the future, and I hope I don’t fail too bad in that endeavor. The Christian in me is conditioned to say that Brandy is in a better place, God has a plan, and all that stuff that is meant to make it better, but really doesn’t help very much. The Buddhist in me is learning that life is a cycle, and we will get through this like we get through everything else. More comforting for me, but hard to explain to a 10 year old. The Dad in me knows that I love my daughter (and all my children) more than anything else in the world, and I will always be there for her, through the both the joy and the pain. Hi Bill, I’m very sorry to read about Brandy. My best to you and your family.